THE FELONS was the setting this week for the launch of a new 1916 Belfast Heritage Trail. Whilst the main events of Easter Week centred in and around Dublin, the full story played by those from Belfast in the Rising has never fully been recognised – until now. This new heritage trail uncovers the story and recognises the roles of many individuals from the city who played their part in organising one of the most historic events of the 20th century when a small group of Irish rebels took on the British Empire. 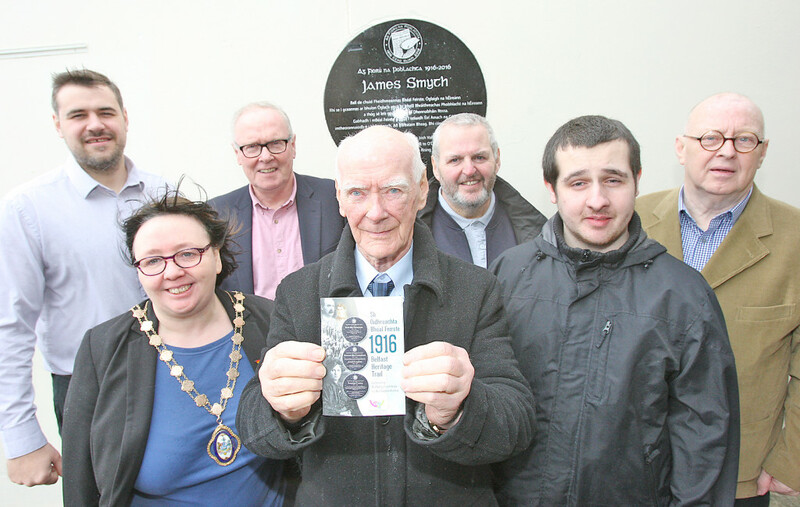 The heritage trail, which was funded by the National Lottery Heritage Lottery Fund and Belfast City Council, comprises of 15 granite plaques which have been commissioned and erected throughout the city and which helps uncover Belfast’s hidden connection with the Easter Rising. The tours will be taken by Belfast Taxis CIC. Drivers will bring customers around North, East, South and West Belfast to visit the historic locations. Chairing the launch was Harry Connolly of Fáilte Feirste Thiar who said: “Planning a hugely significant year of celebration and commemoration in 2016 was also a year of discovery and that discovery is what we are launching here today in the form of this groundbreaking Belfast Heritage Trail. Attending the launch were some of the family members of those important people who took part in the 1916 Rising, among them were family members of Winnie Carney, the Corr sisters, the Monaghan family and family members of Seán Mac Diarmada. Heritage Development Coordinator for Fáilte Feirste Thiar, Joe Austin, said: “History is not about dusty books and faded photographs, it’s about the living understanding of an event that shaped the lives of everyone in this city. Other sites to take in on the Heritage Trail are the James Connolly statue on the Falls Road and the 1916 commemorative murals in Ardoye, New Lodge, Ormeau Road and Falls Road. To book a 1916 Taxi Tour call: 07892 16660.